Since 2014, Audience Audit has partnered with Agency Management Institute to develop and share custom research designed to help marketing agencies better understand their clients, their prospects, and even their employees. The research results are publicly shared each fall through a summary report and online webinars. Coming soon! Agency Edge 2019 will be revealed at Content Marketing World in September! This year marks our first with an international group of respondents, and we’ll be digging into the factors influencing companies to work with agencies outside their own geography and exploring the role respondents want agency owners to play in their account. 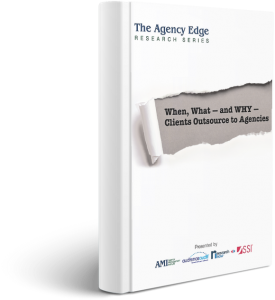 Hear what senior decision-makers at over 550 agency clients say about their decision to outsource work to an agency vs. keeping it in-house. You’ll learn what kinds of work they want their agencies to do, what frustrates them enough to pull work in-house and how they feel about their own internal resources. We also tested many of the assumptions — it’s all about cost, clients with fewer internal resources outsource more often, etc. — that agencies make every day. We think you’ll be surprised at what we learned. Unveiled at INBOUND 2017, this study dives into what agency clients really expect and desire from their agency AE’s, and features insights from over 500 clients across the U.S.
Clients who work with agency Account Managers share their perspective on how your AE’s are doing (and what they should be doing). 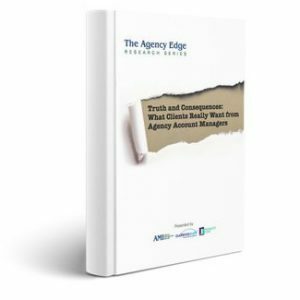 Tons of great insight for agency owners and Account Managers to help determine the right clients for your agency, the right AE’s for your clients, and how to keep everyone happy. First presented at INBOUND 2016, our third study turned the tables to better understand the attitudes and needs of agencies’ own employees — especially the “Millennials” that represents the next generation of agency leaders and seem to be the source of heartburn for many agency owners. Over 950 full-time agency employees from across the U.S. participated in the study, from 18 years old and up. They reveal the influences on their decision to pursue an agency job, how they first heard about agency opportunities, career goals and how they feel about the agencies that currently employ them. The research also sheds new light on those employees 18-34 — what’s important to them, what they want and the extent to which they differ (or don’t) from older employees. The different attitudinal segments revealed can help agencies understand what’s important when hiring and developing employees, and how to engage top-notch performs of all ages for the benefit of their agency. Unveiled at BOLO 2015, our second study explored circumstances and motivations behind the hiring and firing of marketing agencies with 500 agency clients who have hired or fired agencies in the prior two years. The analysis once again identified distinctive attitudinal segments within this group, ranging from those who trust and rely on their agency partnerships to those who see the choice as largely transactional or even anticipate a less-than-satisfying relationship with their agencies. The study also offers insights into clients’ approach to budgeting and their spending priorities, where they find agencies to consider and how they identify the best agencies for their organizations. Revealed at the BOLO conference, our first custom segmentation study explored the considerations that agency prospects value in their agencies. The study found three very different client types, each of which has its own perspective on agencies’ roles, their value as a resource and the types of agencies they prefer. It also offers helpful insight into what agencies should start doing — and, perhaps more importantly, what they should STOP doing. Have a topic you’d like to see us tackle in a future Agency Edge study? Tell us about it! Interested in how custom segmentation research can drive thought leadership for your agency or your clients? Contact us!